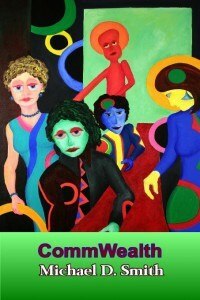 I used some of my amateur theatrical background in CommWealth, which focuses on the Forensic Squad acting troupe as it stages Allan Larson’s mediocre plays and later, during a tense, crazed rehearsal, explodes into bitter accusations of marital infidelity and political espionage. The CommWealth system has outlawed all private property. Your house, your clothes, anything you possess, can be demanded by anyone to be enjoyed for thirty days. The actors in Forensic Squad adapt as best they can to the resulting chaos, but CommWealth probes their breaking of the Four Rules that ineffectually sustain the system. Several actors confront betrayals, double agents, and murder–and eventually find themselves leading a suicidal revolution. In any case I was exposed in college to both mediocre actors and directors, and talented ones with large but fragile egos, and I suppose my ego was also on the line since I was acting as the War Correspondent in a comedy I wrote about high school romances called Total Annihilation: Camouflage! By the third performance my fellow Rice University student actors had grown bored and set out to sabotage my play with silly onstage antics. At the beginning of the second act, as the lights came up, the War Correspondent was to kneel with a handkerchief and mop up a small quantity of stage blood, show the gore to the audience, and declaim in traumatized tones about the apocalyptic quality of young love: “This … this is all that’s left …” However, as the lights came up on the parquet floor on Night Three, the War Correspondent was confronted with an entire bottle of ketchup poured into a twelve-inch puddle. Gamely he knelt and sought to soak up the mess with his tiny handkerchief. Hands spattered with dripping ketchup, he struggled to suppress his righteous authorial anger even as he fought not to laugh. Somehow he managed to deliver his well-memorized lines. This episode definitely helped make the absurd theater scenes in CommWealth so rewarding.